Vegetation carries out photosynthesis to create energy, and this function is performed by chlorophyll. When making chlorophyll from nitrogen compounds, iron is needed. Without iron, chlorophyll cannot be produced and the plant will be unable to photosynthesize. 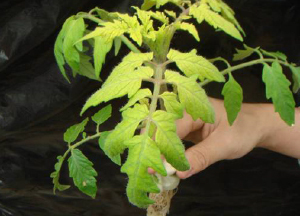 Soil with high pH or in a poor environment such as low warmth or low light, iron absorption suffers and the color of the leaves will become lighter. In these circumstances, providing easy-to-absorb iron restores the health of the plant. Plant nutrition consists mainly of the elements nitrogen (N), phosphate (P), and potassium (K). Iron is one other essential nutrient. Without iron, even with enough of the other nutrients, the growth of the plant will be limited. In addition to synthesizing chlorophyll, iron is also used by mitochondria to produce energy and convert nitrogen fertilizer into amino acids.